Rockin' it Out: Amsterdam: 30th by 30! One of my goals for 2012, since I turned 30 years old, was to visit my 30th country. While I could've stretched it a few weeks before by visiting Liechtenstein, I certainly preferred to have the Netherlands as my 30th country. I must admit that 30 should be asterisked, since I have counted individual parts of the United Kingdom as sovereign nations (i.e. Scotland, England, and Northern Ireland). I would argue, however, that these portions have cultures different enough to justify counting them as separate nations. Anyways, the goal was met and this blog describes the trip that met the mark. 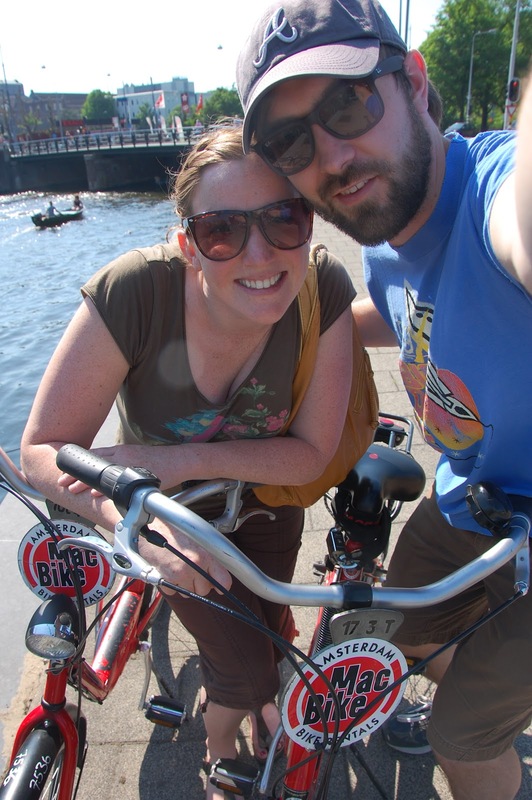 "I Amsterdam" is the well-known sign that tourists love to photograph. To me the only thing missing is a heart in-between the I and the A. For only being about 4 hours away from Frankfurt, it's surprising that it took us nearly 2-years to visit, but we're really glad that we did. 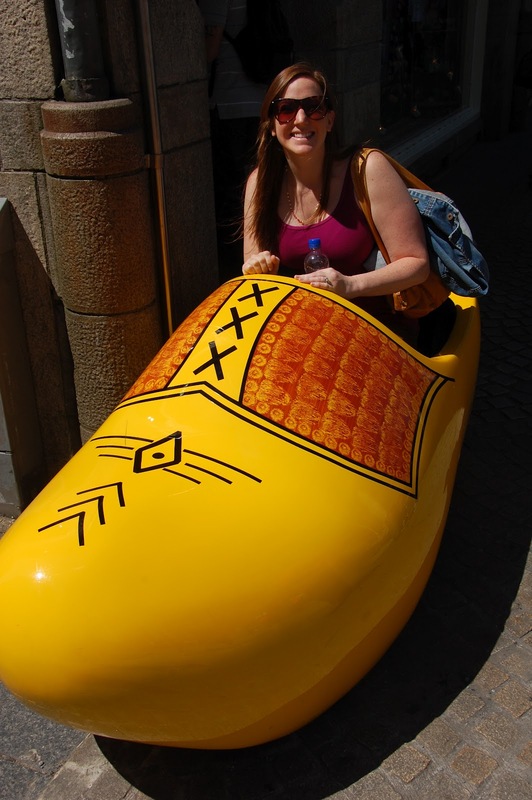 Of course my idea of Amsterdam fit all of the stereotypes......the coffeehouses......the red light district.....hostels with bedbugs....etc. 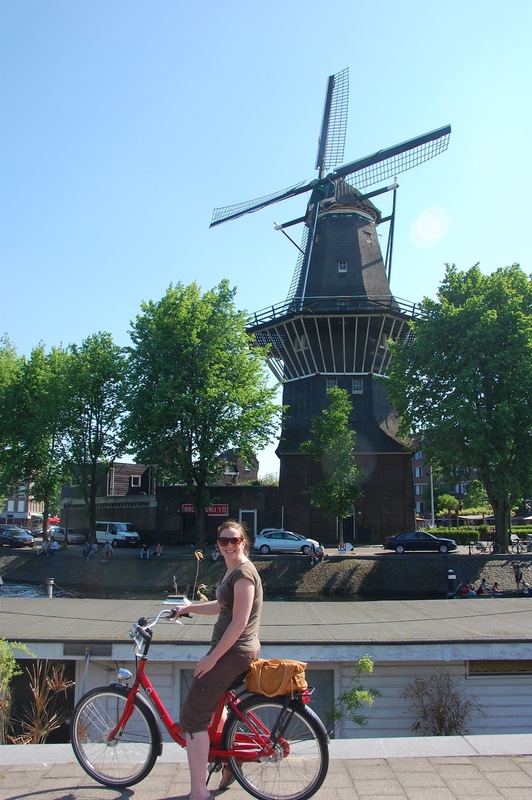 However, I was pleased to find that, while those components certainly are present in Amsterdam, the city has so much more to offer. If you want to go for the pot and hookers, it's there, but there's plenty more to see in Amsterdam. We enjoyed a nice little breakfast at a local joint on our first day. Like other European cities, Amsterdam has a huge system of canals, with countless bridges traversing them. Of course Holland is famous for its flowers, so we went through the flower market. Unfortunately they don't sell many flowers that are already bloomed. Rather, they sell the tulip bulbs and seeds for other flowers. 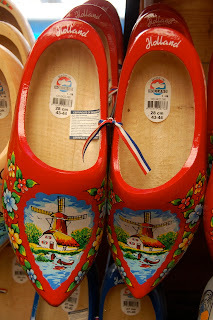 The flower market is also a great place to buy the trademark wooden clogs. 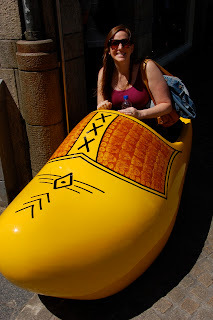 I certainly didn't spring for these impractical shoes, but they'd be nice decorations or flower pots. So obviously many folks come to Amsterdam for the party-atmosphere. If you're out and about before noon you just may come across people in this state. 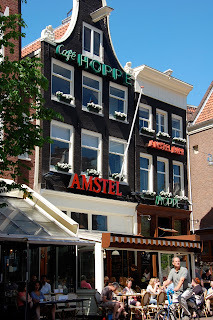 Lots of great little cafes and places to drink beer - like Amstel. One of my favorite photos from the trip. This joker will probably wake up not knowing exactly where he is and how he got so sunburned. Amsterdam: where bicyclists have more rights than pedestrians. You really have to be careful when walking around because you just might get run over - I saw it happen at least twice. Another popular tourist photo-op. I think this should be the car for a theme park ride - maybe "It's a small world". Love this beer store just a block from the main plaza. We got plenty of tips on local beer and local beer-drinking establishments. 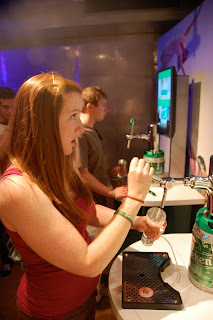 We also partook in the Heineken Experience. I can't say that the beer is very good, but the marketing is impressive. As in any good brewery tour, we ended with the tasting. However, this was the only tasting where they suggested that you "let the beer come to you" by tipping the glass back and drink it quickly. This is the only way that you can bypass the bitter-tasting head and get the authentic Heineken taste. I summarize by saying that you should drink Heineken really fast if you want it to taste better. Alternatively you can drink Heineken after drinking four of anything else. 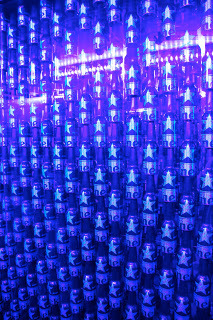 We did find out that Heineken makes these exclusive aluminum bottles that change under black light for use in only the sickest clubs in Europe. 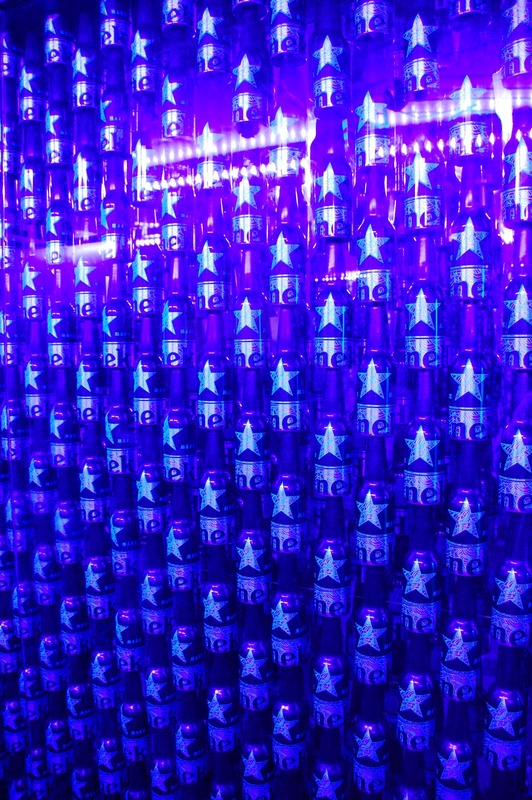 Needless to say, we never saw these bottles before. In the interactive portion of the tour we were able to practice our "perfect pour". Marisa went first and "needed improvement". I went second and indeed, had a "perfect pour". Honestly, the two pours looked exactly the same so I really can't brag too much. 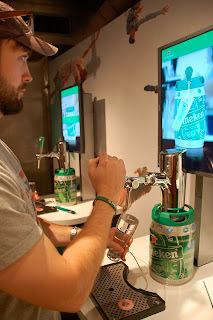 I definitely recommend the Heineken Experience, whether you like the beer or not. It was definitely entertaining for at least an hour. The famous sign is in the southern part of the city, near the main art museums. People and dogs alike enjoy hanging out in the fountains near the museums. We came down this way to check out the Van Gogh museum, where pictures weren't allowed. We used our rented bicycles to trek out to this little brewery "'t IJ" (pronounced "eye") which I highly recommend. 't IJ has some nice beers on tap, our favorite being the "Columbus" which is a 9% tripel. We like the tastings here because all of the servings are a smaller size, which helps to make it through all of their offerings without getting too crazy. Posing with the rental bicycle along the canal in front of the brewery. We had no idea that Amsterdam was such a great beer-tasting city. 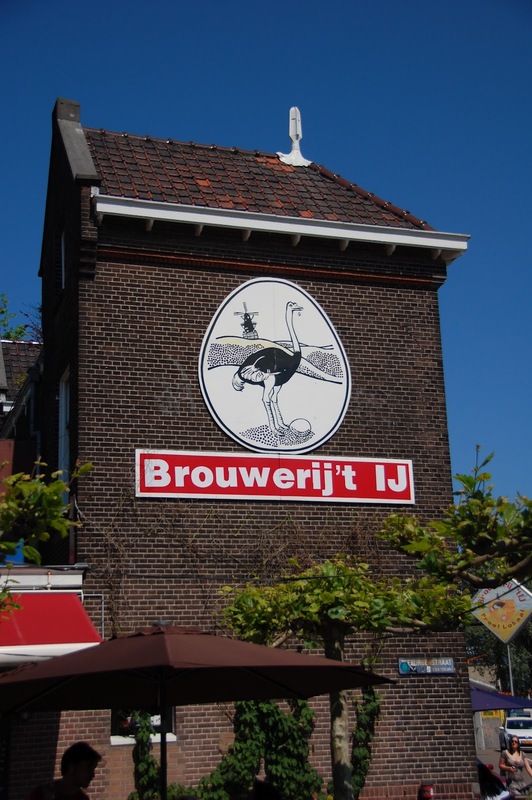 Holland is growing in their love for craft breweries and it has resulted in nice little beer bars that only serve Dutch beer. While sampling some Dutch beer we were distracted by some commotion out in the canal outside the bar. I should mention that Amsterdam must be the bachelor party (or "stag party" if you're from the UK) capital of Europe. Well here we have one of these parties where one member was pushed off of the boat and into the canal - in full clothing. We watched him struggle to get back in the boat, to no avail. Instead, his buddies threw him a rope and proceeded to drag him along the canal...........which didn't look very clean to me. The "triple x" flag is the symbol of Amsterdam. Now I'm not sure about the history here, but perhaps this is where the triple-x rating comes from? Amsterdam and the Netherlands is definitely a place that I would recommend and that I would come back to, either to live or to visit. I wouldn't have wanted to reach this milestone anywhere else and I'm glad that we fit it in before leaving Europe.